One of the first landfalls settled by the Redguards when they sailed east from their lost homeland of Yokuda, the island of Stros M'Kai is now a haven for freebooters, sea-rovers, and other nautical entrepreneurs who roam the Abecean Sea. 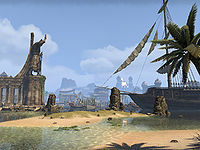 Stros M'Kai is a desert island off the coast of Hammerfell. The island was one of the first landfalls settled by the Redguards when they sailed east from their lost homeland of Yokuda. Stros M'Kai is a haven for piracy, and many of the Pirates of the Abecean Sea consider it their home port. The island is run by Headman Bhosek from his palace in Port Hunding. Small whale-bone whistles, carved to resemble reclining mermaids, are a popular item between the sailors and pirates of the island, specially to those of Saintsport. 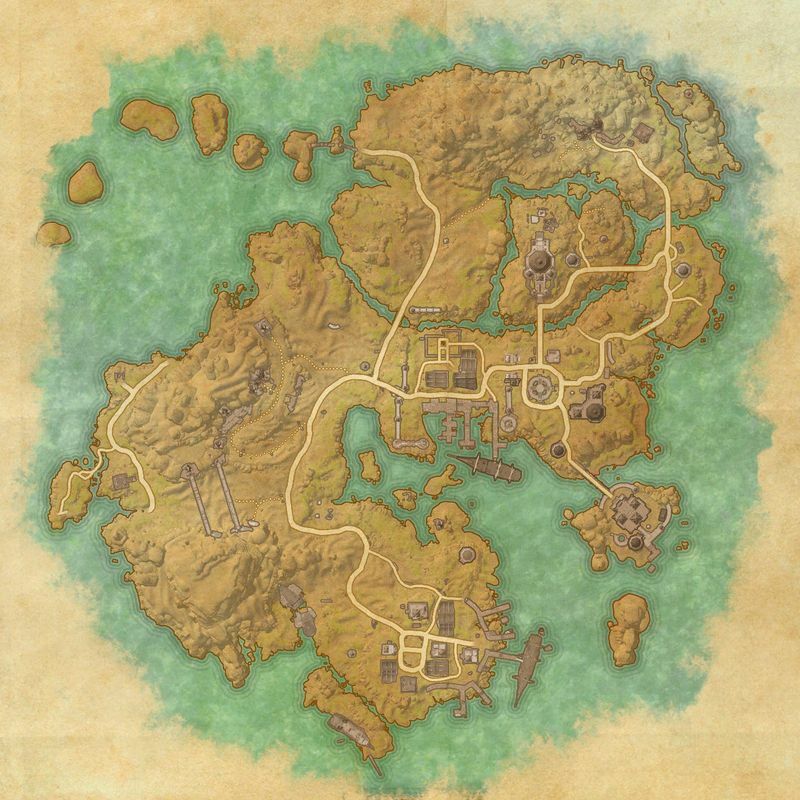 The island is where Daggerfall Covenant players begin their journey after escaping Coldharbour. Over the course of the Covenant questline, Captain Kaleen will hire you to gather a crew to raid Bhosek's palace and find proof that he has violated the law of the Redguard king Fahara'jad calling for an end to the raiding of Breton shipping. The Broken Spearhead: Visit Stros M'Kai to repay the debt to your rescuer. The Spearhead's Captain: Make contact with a noted privateer. The Spearhead's Crew: Gather Kaleen's crew to help with a heist. Tip of the Spearhead: Steal some documents from a local thug. Dead Man's Wrist: Bring Siraj's sister news of his fate. Izad's Treasure: Find a pirate captain's buried treasure. Last Night: Rescue victims of the Sea Drakes. Moment of Truth: Help a timid Orc prove himself. Sphere Assembly: Help repair a broken Dwarven automaton. Washed Ashore: Follow a monkey to treasure. Stros M'Kai also appeared in Redguard. This page was last modified on 23 January 2019, at 21:57.